This week marks one hundred years since the beginning of the First World War. The war impacted virtually every segment of society, including sports, and few – if any – athletes or sports organizations remained unscathed. Sport plays an important role in how the War is remembered and commemorated. In particular, the now infamous Christmas Truce football match has become a focal point for how we understand the War (Ross Wilson’s excellent article about football and the the heritage of the Great War outlines these contemporary uses in greater detail) While different authors and sports organizations have looked at the sport history and heritage aspects of the First World War from different regional or national points of view, the War’s impact on cricket in England, in particular, seems to have attracted a great deal of attention. The third test match between England and India in Southhampton this week was one of the focal points for cricket’s commemoration of the First World War. 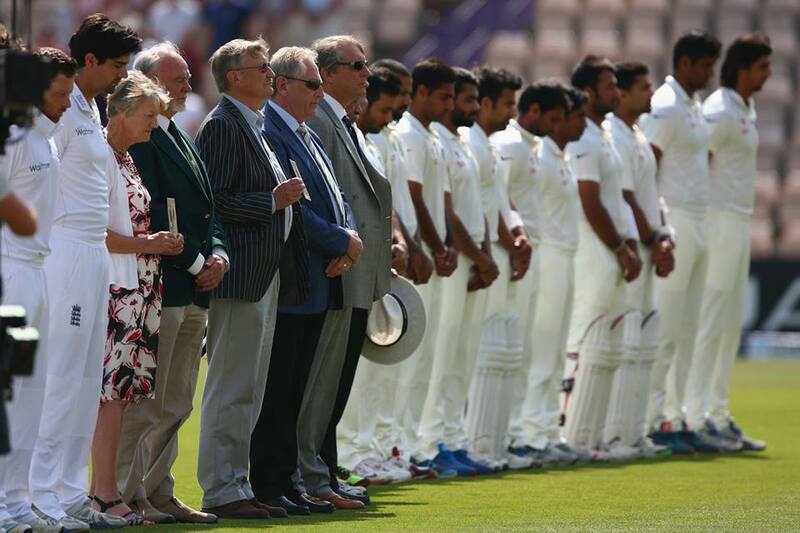 Both the England (above) and India (below) test teams paid their respects to the cricketers who fought and died in the War. The War’s impact on England’s test team, as well as first-class county cricketers, was immense. Hundreds of cricketers enlisted, and many – including four from England’s test team (basically, a quarter of the “national” cricket team) – never came home. 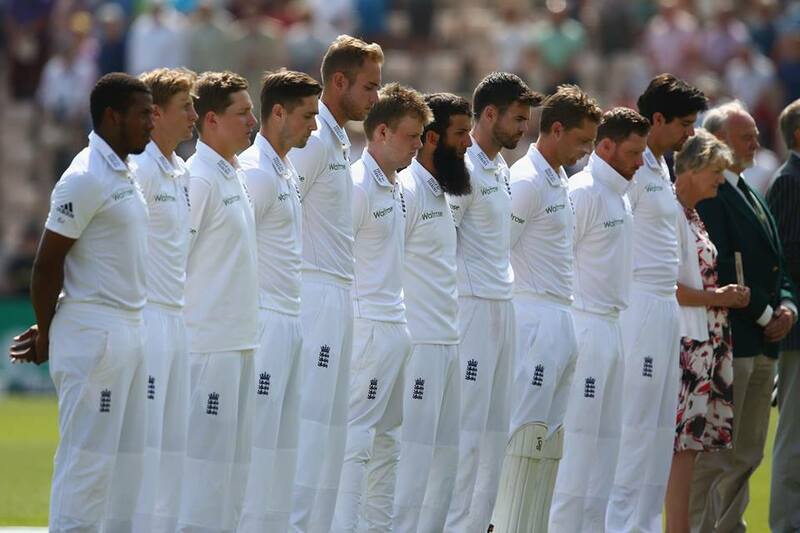 July 29th’s Test Match Special podcast from the BBC featured a discussion about the players who served and died, as well as the impact the game had on domestic competitions and county cricket clubs. Many clubs nearly went bankrupt in the War, while competitive cricket was largely abandoned, only resurfacing for occasional charity matches to help fund various wartime causes. Other recent publications have looked at cricket and the First World War in England and, though I have not read them yet due to North American release dates, I look forward to reading books like Wisden on the Great War and The Last Over. The interesting aspect of India’s part in this week’s commemoration is less about remembering Indian cricketers who died in the First World War, but reminding the wider world the immense role that India played in the war effort. By 1918, nearly 1.3 million Indian soldiers served in the War with nearly 130,000 casualties, 75,000 of which were deaths. Despite the contribution India played in the war, the country’s role is often overlooked, diminished, or ignored entirely in official commemorations. Part of this, as is suggested, certainly has racial overtones, but also points to another heritage issue, that of whose heritage gets remembered, by whom, and why. If nothing else, India’s test cricket team being (seemingly) an equal part of this recent public commemoration points to sport being used as a vehicle to perhaps address some of these larger heritage issues. Addendum: Many thanks to Andrew Renshaw, editor of Wisden on the Great War, for sending this article that was part of the England v. India match programme from the third test at Southampton. In it you will find more details about both English and Indian cricketers that served, and were lost, in the First World War. By Gregory Ramshaw in Uncategorized on July 31, 2014 . My article on ‘Cricket’s Sacrifice’ in the Test match ECB programme mentioned the deaths of the Indian soldiers so they were indeed remembered too. Thank you for your comment and for the information – that’s great to hear! Is there a link to your article from the match programme, or do you have something you might be able to send me so that I might add an addendum to my post? In many ways, I find it really interesting that sport – and cricket in particular – has been one of the main ways that the wider (and often overlooked) aspects of the War have been remembered. As I say, the fact that India was central to the commemoration not only acknowledges their cricketers’ sacrifice, but also helps to have the larger story of the War understood. Thank you again for your comment. My copy of Wisden on the Great War was pre-ordered several months ago – I look forward to receiving my copy later this summer! I hope this will arrive OK. I was amazed to read that you cannot yet get my book, because there are almost 200 members of the Canadian forces with obituaries and some fascinating American stories. Here is a pdf of my Test match programme article. Do use it if you think it worthwhile. Unfortunately, I don’t think the pdf transferred (WordPress is a bit tricky at the best of times). If you could, would you be able to send it to my email gramsha(at)clemson.edu ? I really look forward to reading it and adding a link to the post if WordPress allows. As for the American release of the book, I believe it isn’t available through Amazon until mid August (I find that they release most of the Wisden publications here are two to three months after the UK). I read the feature about the book in The Times in May when I was overseas, and immediately ordered a copy to receive back in the US. In any event, I really look forward to receiving it. Very much enjoyed your discussion with Aggers on TMS this week as well. Again, thanks for getting in touch – really appreciate it!